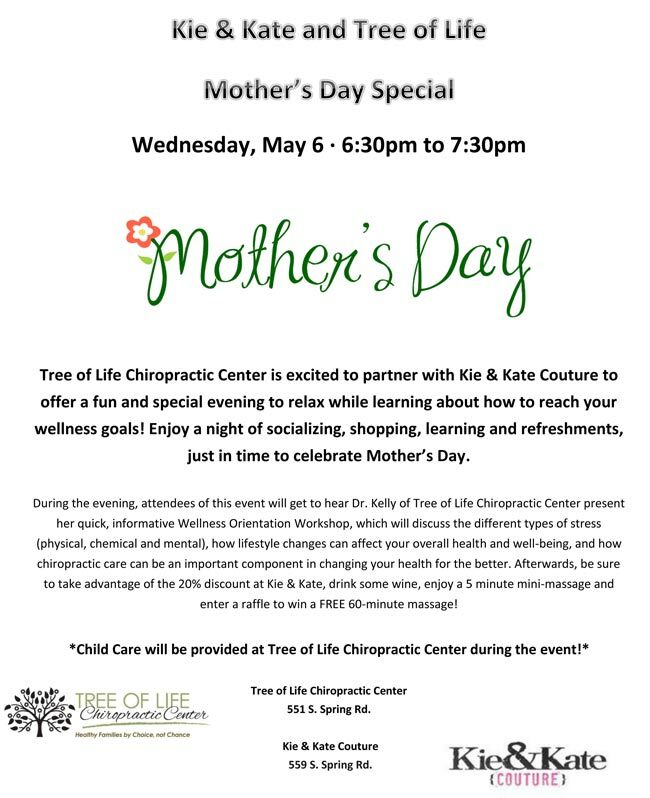 Tree of Life Wellness Center is excited to partner with Kie & Kate Couture to offer a fun and special evening to relax while learning about how to reach your wellness goals! Enjoy a night of socializing, shopping, learning and refreshments just in time to celebrate Mother’s Day. During the evening, attendees of this event will get to hear Dr. Kelly of Tree of Life Chiropractic Center present her quick, informative Wellness Orientation Workshop, which will discuss the different types of stress (physical, chemical and mental), how lifestyle changes can affect your overall health and well-being, and how chiropractic care can be an important component in changing your health for the better. Afterwards, be sure to take advantage of the 20% discount at Kie & Kate, drink some wine, enjoy a 5 minute mini-massage and enter a raffle to win a FREE 60-minute massage!